Visit often to see a great selection of gift and seasonal items. 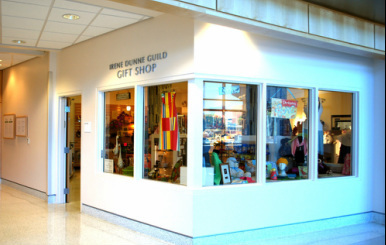 Please visit the Irene Dunne Guild Gift Shop at Saint John’s Health Center, located in the lobby of the Tarble Atrium near the main entrance of the Health Center. The Gift Shop offers a large selection of unique gifts. We gladly accept all major credit cards. During the Presidency of Jill Robertson, the Health Center contacted the Guild and asked if they were interested in funding and creating a gift shop for the hospital. The Guild jumped in immediately and formed a committee, which began by touring and investigating other gift shops. The Guild then began assisting in the design of the space and pledging to fund the build out of the raw space. They further helped in the hiring of a gift shop manager. Currently, several members volunteer as sales personnel.